Save Your Seeds for Snail-Mail Seed Swap! As the temperatures drop and the days get shorter, do not despair! There's still a lot to do in the garden, and saving your seeds is a great way to save money and get more plants! Trading seeds with other gardeners is even more fun! 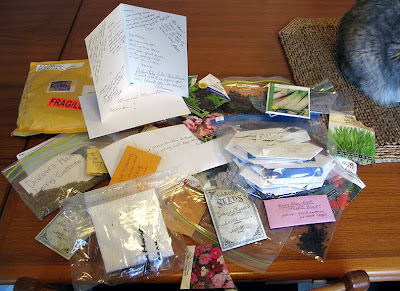 In January (in time for us winter seed sowers), I'll host my second annual round-robin snail-mail seed swap. I'll post official directions and sign-up instructions in December, but start collecting seeds now. For a preview, check out last year's instructions. ❀Yes, I know it's a terrible ear worm. I apologize but I think I'm a bit high on bathroom cleaner fumes, and OK, I'll just say it, I like some disco. Not so much this song, but it just fits! But please don't let my poor taste in music prevent you from participating in the swap! It was a hoot last year. Everyone brought their disco RECORDS to the ball game and got in for a buck. The records were blown up in the outfield between games in a double-header. They started the field on fire, nearly caused a riot, and rendered the field too damaged to play on. The SOX had to forfiet the game. Ah. . . memories! The seed swap sounds like fun - maybe I'll participate this year. Count me in. I enjoyed it last year. Oh, mom loves to collect seeds! Monica, Rose and I have our seed envelopes at the ready! They were clearing out a couple of storerooms at work and threw away some boxes of coin evelopes-the brown, 500 in a box kind. So being ever alert, I grabbed one to share with Rose so we could save our seed and participate once again in the seed swap. Waddya mean!!! Poor taste in music!!! I LOVES me some disco! I shook and gyrated and bumped with the best of them. I wore ridiculously high platforms and silver lame and tube tops and polyester. I had such fun! I was a "Pic Chick" (a la Piccadilly Circus in downtown Halifax. And boogied at The Misty Moon and the Cellar! I even had a haircut like Tenille from The Captain and Tenille. (And I did a practice run on the Afro before the perm --- and decided against the perm! Whew!!) Yeah, those were some great dancing days. Anyway, I digress .... Sadly I will not be part of your wonderful seed swap. But I will boogie (or attempt to) while you guys swap! I was just thinking the other day that I really need to save many more seeds than I did last year--everyone should have some of Tina's orange cosmos! As Beckie said, she brought over 100's of envelopes so we will be well-prepared come January. Can't wait, and thanks for organizing this again. K.C. and the Sunshine Band, wasn't it?? These had to be some of the dumbest lyrics ever, but such a catchy tune. Linda's comment about the riot at the Sox game reminded me of that incident. Disco has gotten such a bad rap in my opinion--the Bee Gees are still one of my favorite groups! I like to think we are secure enough in our coolness to admit we love disco...and seed swapping for sure!!! Sounds fun :) I have been collecting seeds for the Cottage Garden Society which has a seed exchange but might have some surplus. Not only am I collecting my own seeds, I'm collecting some from my mom's garden. She gave me a couple of Platycodon seedheads, and I do not want to try to get them to germinate. So I should have some seeds for a seed swap. Japanese Tree Peony seeds, anyone? I've already started. The asclepias tuberosa pods have started bursting so it's now or never to save their seeds. Pulled about eight pods yesterday. I'm a seed collector too..they're fascinating! BeeGees, KC&the Sunshine Band...woot! That takes me back quite a ways! I remember you asked me last winter about this and I declined. I think I'd like to participate this time! I've never participated in anything like this before. I would like to try this. "Workin' at the seed swap, yea!" (to the tune of "Car Wash" :) Sounds like great fun-count me in!